This is a monster from Bestek family – the America’s leading power inverter brand. Every Bestek inverter is colored in red, it is solid and nice. Bestek 2000W power inverter is the best inverter for solar generator or for RV. It also can be used in your car, connected through cigarette lighter, but it’s too big and too much power for using in the car. The Bestek 2000W inverter was designed as a portable inverter. It has 3 AC outlets but no USB port. It has numerous safety features to protect batteries and your devices. 6 external 50A fuses keep your gear from damage. If the input voltage from the car battery drop below 10.5 volts, an alarm will sound. If the voltage drops below 10 volts the inverter will automatically shut down. This will protect the battery from completely draining. The max output of the device is 2000W at 115V, or 2000W/115V = 17.39A. Therefore, any device pulling less than 17.39A at 120V will run on this inverter, so long as the peak Watts also stay < 4600W during motor startup. This is a modified sine wave, not pure sine wave. If you read its specifications on Amazon.com, you wouldn’t see any information about this. Modified sine wave is not recommended for dedicated devices, but if you are planning to run a simple system, it’s OK. This inverter requires only the most basic forms of care and maintenance. You must keep the inverter dry. Don’t expose it to moisture and don’t operate the inverter if it gets wet. Keep the power inverter away from heating vents, radiators, and direct sunlight. Also, this inverter is designed only to be used with a standard 12-volt battery or group of batteries that total 12 volts. Do not attempt to use it with other battery types. Six external 50A fuses Added. Not only protects the home appliances, pumps, and motors from damage, but also be convenient to replace fuses. The Krieger KR2000 is a heavy-duty, compact 2000 watt power inverter capable of powering the most demanding loads. Connect the KR2000 directly to a 12 Volt DC battery or battery bank to power televisions, home electronics, power tools and other appliances in your car, truck, boat or RV. The Krieger KR2000 has dual AC outlets and dual USB charging ports to keep your device charged. This power inverter also features a convenient LCD display showing output wattage, input voltage, battery level and warning indicators, so you will never be left in the dark. The KR2000 has been tested and complies with both UL 458 and CSA Std C22.2 standards, making it safe and reliable. Additionally, this inverter has all the protections you will need including low voltage, high voltage, overload, temperature and short circuit. Everything you need to get started is included with the KR2000. This inverter includes 3ft #2 AWG battery cables, a 200 Amp ANL fuse kit as well as a remote switch with a 20ft cable. Backed by a 3-year warranty, the Krieger KR2000 power inverter will never leave you without power when you need it! PowerDrive RPPD2000 power inverter is a high performance solution to using household power while on the road. This compact unit gives you an easy way to harness the power of your vehicle is battery to charge or power cell phones, TVs, laptops, iPods and other on-the-road essential electronics. With three AC outlets, it is perfect for professional drivers and a smart idea for family camping or road trips. Sturdy yellow and black casing stand up to the rigors of life on the road. Another great innovation from RoadPro, your trusted travel companion, bringing the comforts of home to on-the-go living. The output waveform of PowerDrive RPPD2000 is referred to as “modified sine wave.” Some very sensitive electronic equipment and some medical equipment may not operate satisfactorily on a modified sine wave. It is a stepped waveform designed to have characteristics similar to the pure sine wave shape of utility power. A waveform of this nature is suitable for most AC loads (including linear and switching power supplies used in electronic equipment, transformers, and motors). Powerful: From high quality components that deliver up to 2,000 continuous watts. Mobile: From Bluetooth enabled circuitry, free mobile-paired app, and removable remote control that allows remote connectivity to monitor and customize performance. Convenient: With Multi-, Diverse (AC, DC, and USB) Power Outlets, and options including Swivel Direct Plugs (to mount in tight spaces), and Battery Cables to conveniently allow installation. Reliable: With a Voice Alarm (to provide four status warnings), Auto Safety Turn-off (to prevent temperature swings and overload), Output Wattage Indicator (that provides a digitally numeric or visual indicator to actively monitor performance), Replaceable Fuse (if necessary, to enable long-life performance with low-cost maintenance). Design-Savvy: With an illuminating aerospace design that glows to reinforce that power is active. Durable: With an ABS PVC Composite Housing that is tough and rigid to protect electronic components from abrasion and damage. Using Bluetooth® wireless technology to remotely access features and settings through mobile app (iOS and Android). There are no cigarette lighter and cables included, you have to buy them separately. This convenient machine will easily push out 2000 continuous watts of a modified sine wave. It can also hit twice that for peak power. All it needs is 12 volts of direct current from your car’s battery and it will convert it into 120 volts of alternative current. Aside from your car’ battery, you can also plug this inverter right into the cigarette lighter, which makes getting the wattage you need extremely convenient. To access this power, you’ll find two North American alternating current outlets available. It even has two additional USB charging ports. They’re 2.1A shared and work with an iPad or iPhone without issue. Besides those two products, this inverter is perfect for other consumer electronics like laptops, tablets, cell phone chargers and other smaller USB charging devices. The slick LCD display on this inverter makes it easy to tell exactly what’s going on with your machine. There will never be any surprises as far as its operation is concerned. This machine also has an extremely quiet thermal fan. It works not only for safety reasons, but also to keep the machine capable of kicking out such high wattages consistently without overheating or succumbing to other issues. Thanks to this fan, the Energizer 2000 Watt Power Inverter is always cool to the touch. Fortunately, that fan doesn’t turn on until it’s absolutely needed—not that it makes any noise, but you don’t want to waste energy on a component that doesn’t serve a purpose. LCD display shows how much power is being pulled, make using much more convenient. This inverter does not come with any cable and cigarette lighter, you have to buy them separately. You can’t turn off inverter light when the unit is on. This inverter provides total 2000W power with 2 AC outlets and 2A USB to handle those motors from household AC units and run a garage (flood lights, a TV, a freezer, a refrigerator, rechargeable devices, etc). 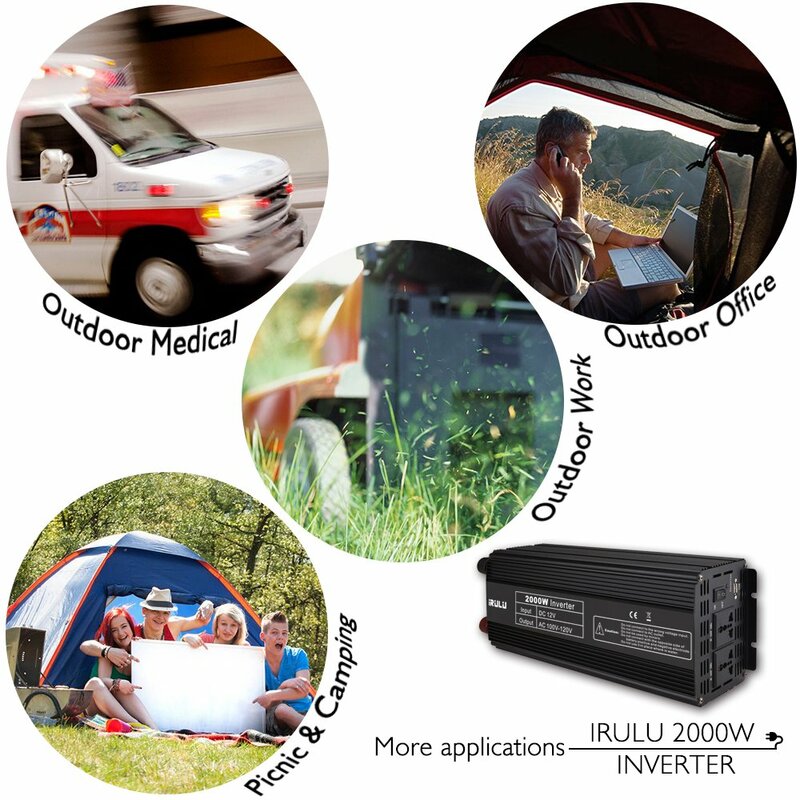 The iRULU inverter is totally safe to use. The power inverter has a variety of different built-in safety features including 8 external 50A fuses added, an overload protector and a temperature gauge. If there is a power surge, the inverter will automatically shut down. However, this does not damage the device in any way and testing appliances won’t harm the inverter. Another option the power inverter offers is the low battery alarm and shutdown. If the input voltage from the battery drops below 10.5 volts, an alarm will sound. If the voltage drops below 10 volts the inverter will automatically shut down. This will protect the battery from completely draining. If this does happen, simply turn the power switch to the off position, fix the voltage problem and restart the power inverter. The iRULU 2000W power inverter has a very durable construction, quality material stands up to harsh environments and all season. Black-Aluminum alloy with heat dissipation faster, more sturdy, compact structure, convenient storage. It is suitable for camping, long-distance travel or any need DC inverter for the exchange of local. It is the essential products of outdoor work, car driving and travel. AIMS Power has been a leader in power inverter products for 15 years, they deliver the most complete line of dc power inverters available today. Compare the Aims power inverters to the competition and you will not only see that they are less expensive, but that the Aims inverters features and specifications are the same or BETTER! If you are like most of their inverter customers, you are mostly interested in buying a quality inverter, not paying for another manufacturer’s marketing campaign. AIMS Power 2000 watts pure sine wave inverter is a combination of an inverter and battery charger with an AC auto-transfer switch into one complete system with a peak conversion efficiency of 88%. It is packed with unique features and it is one of the most advanced inverter/chargers on the market today. It features power factor correction, sophisticated multi-stage charging and pure sine wave output with unprecedentedly high surge capability to meet demanding power needs of inductive loads without damaging the equipment. Use this product for renewable solar, off-grid, mobile and emergency backup power applications anywhere that use 110 or 120 volts of alternating current. This product also has auto frequency detection that allows users to operate at either 50 or 60 hertz. 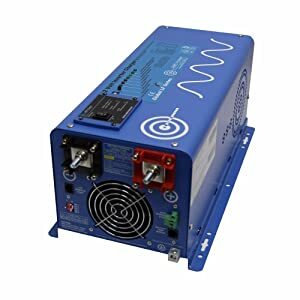 AIMS Power provides 2000W continuous clean sine wave with the peak power at 6000W – 300% of continuous output for up to 20 seconds to reliably support tools and equipment. Another important feature is that the inverter can be easily customized to Battery priority via a DIP switch. This helps to extract maximum power from the battery in renewable energy systems such as solar and wind. 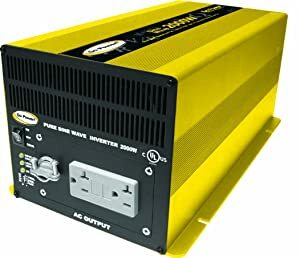 This is the best 2000W pure sine wave power inverter ever, you can’t find out any other inverters that beat this one. 6000W of peak power, this 2000 W inverter easily runs the microwave or the air-conditioner. Tons of good feature, it can handle every heavy duty household applications. But the price is extremely impressive. Go Power 2000W inverter is a solid choice for large loads that demand a clean, pure source of AC power, the Go Power GP-SW2000 can run several appliances and still provide plenty of pure, clean power for the sensitive loads. It comes with 2 different types DC input are 12V and 24V, 12V has been wider in use but if you want to buy a pure sine wave inverter that supports 24V batteries such as solar panel systems, this inverter is a good choice. This inverter provide pure sine wave output that perfect for all household applications in your home, RV, sailboat, and powerboat. It will operate most televisions and VCRs, personal computers, small appliances, and tools such as drills, sanders, grinders, mixers and blenders. To get the most electricity out of this power inverter, you have to read instructions carefully before installing. The MicroSolar power inverter provides 2000 watts continuous DC to AC power and 4000 watts peak output. A “Pure Sine Wave Inverter” produces a real waveform and also switches at 60HZ. It gives the same purity of, power as your electric company does. This is the Inverter/Charger, it will help you charge up your deep circle battery (not a regular car battery). It is perfect power inverter for your RV, your wind turbine or solar generator. It can run all your electronic devices such as TVs, computer, phones, digital clock…Because it is pure sine wave, it definitely runs well with every dedicated electronic device, medical equipment. This inverter has the low battery alarm and shutdown. If the input voltage from the car battery drops below 10.6 volts, an alarm will sound. If the voltage drops below 10 volts or above 15 volts the inverter will automatically shut down. This will protect the battery from completely draining. Another option the power inverter offers is remote wire controller, enable you to turn on or turn off your inverter easily. The cooling fan works fine, low noise compared to modified square wave inverters. 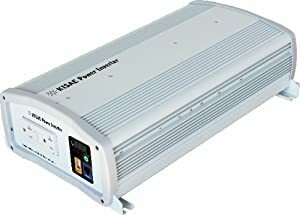 The KISAE SW1220 power inverter converts 12V battery power into pure sine wave AC household power, allowing you to run loads up to 2000 watts. Pure sine wave output is ideal for operating motor loads and reducing stress on surge protection circuitry, meaning potentially longer equipment life. With its state of the art, easy to use design, the SW1220 will offer you reliable service for providing AC power and 5V USB power in your home, cabin, vehicle, RV or trailer. Digital display to indicate battery condition, total output power and warning/error codes. There are a lot of good options for 2000 watts pure sine wave inverter out there, but you know that pure sine wave is very expensive, 2-3 time as much more than modified sine wave. But when you see this inverter’s price at Amazon.com, its will blow your mind. At this price, it was worth a try. So if anyone has any experience with this brand, your input would be appreciated. Power Tech-On inverter is an advanced tool for power conversion. It can supply you with AC power converted from a DC power source. It can be used in cars, vessels, during camping and in power failure emergencies. Pure Sine inverters are a stable power source with 2000W continuous power and 4000W surge power with low harmonic distortion. 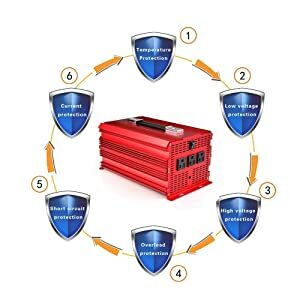 This inverter is an excellent tool to use during power failure emergencies and guarantees maximum efficiency with computers, sensitive equipment and more. Compact and portable, this inverter can be used on work sites, boats, cars, camping or for permanent use. The PS1003 features 5 kinds of protection systems: Thermal protection, Overload protection, Over Voltage protection, Under Voltage protection, Low Voltage protection alarm. Inverter also comes with an LED light that indicates the problem. Cables are only about 12 inches long, too short. The first thing and also the most important thing you need to consider when choosing an inverter is the size. I’m not talking about physical dimensions, I’m talking about the wattage, how much continuous wattage do you need from you power inverters? 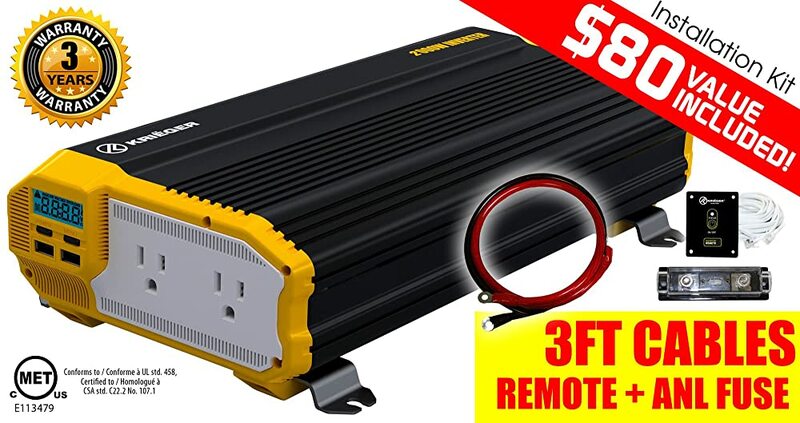 Because power inverter is an electronic device that converts DC (Direct Current) to AC (Alternating Current) – it is very important in case of you are living off the grid or in your car and you want to make sure that you can power your modern electrical devices. 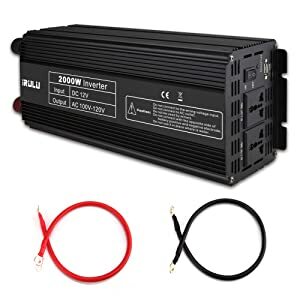 If you are reading this blog post, I’m sure that you are considering to buy a 2000 watts power inverter. We all wonder what characteristics to look for in order to get the best power inverter for your everyday use. But first, you need to understand that why do you need 2000W inverters instead of 1000W or 3000W inverters? Because I wrote another buying guide about how to choose best power inverter. Please read it first to be sure that you won’t miss anything. In order to determine why 2000W is right for you, you need to examine your needs and decide what you need to power with your inverter. You also can easily measure appliance consumption by a Kill-A-Watt meter. With this device, you would know everything about your household appliances, determine which items are costing you the most to run. If you plan on powering appliances such as microwave ovens, you will need at least a 1800-watt to 2000 watt inverter, though a 2500 watt inverter is even better. With this much wattage, you can also power large power tools, toasters, and hair dryers. You will need to implement some special wiring, however, and you may need to incorporate battery banks as well. For some the 2000 watt inverter range may be more practical. You are also going to have to decide on the right voltage to suit your needs. If you are using the inverter with a car, you will probably need a 12V inverter. With some vehicles, however, a 24V inverter may be necessary. Whether or not you need a 12V or a 24V inverter depends entirely on the battery you are using. Therefore, you need to check out the specs on your battery in order to determine if you need a 12V or 24V inverter. 2000W inverters provide a cost-effective power solution for people who require using several devices easily as they reduce the requirement of buying the DC balance of basic home appliances and electrical devices. Inverters are lighter and smaller than power generators, and very easier to use and lesser expensive for maintaining as well. But 2000W is a lot of power since to safeguard users and the devices from electrical damage, inverters should be designed with safety and protection features. Low-battery voltage shutdown: There are many inverter models which shut down automatically while the battery drops to below 10.5V. 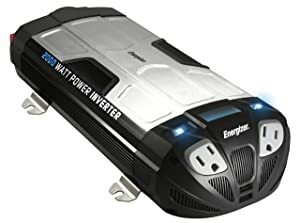 The inverter can be used again only while you connect it to a battery with an output voltage of at least 11.6V direct current. Low battery voltage alarm: It is not good to discharge your battery completely. For this reason, some inverter models are designed with an alarm system which will help you know whether the battery has been around discharged totally. For instance, when the power of the battery goes below 11V, the inverter displays an image telling you to recharge the battery immediately. AC output overload shutdown: For preventing a short circuit and the possible harm it will cause to an electrical device, this feature turns off the inverter automatically when it is producing too much AC electricity. It also shuts the inverter down when the device or load connected to the inverter exceeds its functioning limits. Overheating protection: Inverters produce heat when in use. Thereby, you should place them in well-ventilated areas for preventing them from overheating. However, when keeping the inverter in a dry or cool place is not sufficient, you can count on the overheating protection feature of the device. This feature turns the inverter off automatically when the temperature inside the unit increases above the acceptable range. Overvoltage protection: When it is bad for both the electrical devices and the inverter for being connected to a discharged battery, it is similarly bad for them for being used with a battery with over-voltage issues. For this reason, many inverters highlight the overvoltage protection feature in them. For instance, in an inverter, when the battery voltage exceeds 15V, the inverter automatically shuts down for protecting the appliances. There are two main types of the inverter, modified sine wave and pure sine wave, this refers to the waveform the of the AC output and how it is generated from the DC supply from your battery. We don’t need to be concerned with how these waveforms are generated but the end result is that a modified sine wave inverter is cheaper than a pure sine wave inverter and will run most but not all appliances whereas a pure sine wave inverter produces a cleaner output that is essentially identical to your mains supply at home so will run all appliances. For lights, non-digital microwave ovens, power tools, and other motor driven loads a modified sine wave inverter is fine but the output can cause slight interference on some televisions, audio devices and computers. 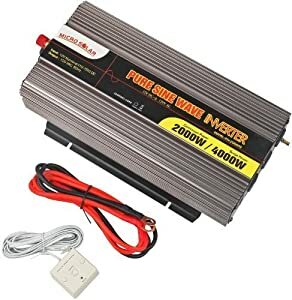 I wrote a very long and detail post in order to help you know how to choose best power inverter, what type of power inverter is right for you, Pure Sine Wave or Modified Sine Wave Inverters. Please read it here. 1. List the maximum wattage that the inverter has to provide (as above). 2. Estimate the number of hours the appliances will be in use between battery recharges. This will differ depending on appliances. As an example, a typical home-use coffee maker draws 500 watts during its brew time of 5 minutes; it maintains the temperature of the pot at about 100 watts. Typical use of a microwave oven is only for a few minutes. Some longer operating time appliances are lamps, TVs, computers and refrigerator / freezers. 3. Determine the total watt-hours of energy needed. Then multiply the average power consumption in watts by the number of hours of run time. For example: 2000 watts for 10 hours = 20,000Wh. Using the 2000 watts (or 200 Amps) for 10 hours example as above, then 200 amps is needed for 10 hours. This provides us with the basic amp-hours (AH) of battery that is required.